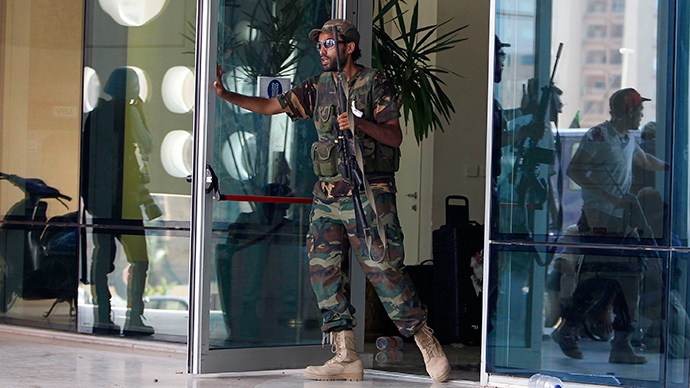 Two Islamic State-affiliated gunmen stormed a luxury hotel in the Libyan capital of Tripoli. They took hostages and killed at least eight people, including an American and a Frenchman, before committing suicide with explosives. US security firm Crucible LLC has confirmed one of its contractors was killed in the attack. The US State Department also confirmed the death of a US citizen, providing no additional details.Tripoli security spokesman Essam Naas added that a Frenchman was among those killed in the attack. “The attackers opened fire inside the hotel, killing four foreigners, two men and two women, who are believed to be from East Asian countries,” added Omar Khadrawi, head of Tripoli security. It was not immediately clear whether the foreigners were guests at the hotel or staff members. The attackers made their way inside the building and through security by blowing up a car bomb in the hotel’s parking lot which killed three guards. Another security officer was reportedly killed in the subsequent shootout. The gunmen then went up to the 21st floor of the hotel, which houses foreign diplomats and representatives of foreign companies. They took 12 hostages there, according to various media reports. When surrounded by security forces, one of the attackers detonated a grenade which killed the gunmen. Islamic State (formerly known as ISIS, or ISIL) claimed responsibility for the attack, according to the jihadist online monitoring service SITE. The confrontation at the Corinthia Hotel began Tuesday morning when a group of five masked gunmen blew up a car bomb in the hotel’s parking lot and broke into the premises. The hotel had European and Turkish guests at the time of the attack. Most of them were evacuated along with the staff, said Hassan al-Abey, a corporate sales manager at the hotel,adding that he was among the evacuees. Some media reports suggest that the attack could be revenge for the death of Abu Anas al-Libi, an alleged al-Qaeda member who was captured by US special forces in Libya and died this month in a US hospital. Libya, a once-prosperous north African nation, descended into chaos when NATO-supported rebel forces took up arms to oust longtime leader Muammar Gaddafi. After scoring a military victory, various rebel groups failed to form a stable government, with the country de facto being partitioned into rival territories. Libya’s parliament was forced to move to the eastern city of Tobruk after Islamist-allied militants seized control of Tripoli. The country’s internationally-recognized cabinet is holding sessions in another city in eastern Libya, Bayda. But even those cities are far from being safe. A deputy foreign minister was kidnapped from his hotel room in Bayda on Sunday, and released a day later.